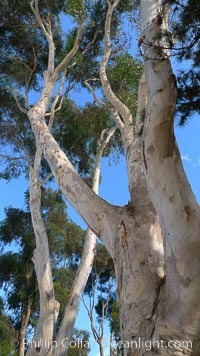 Species: Gum tree, Eucalyptus sp. To find other prints that may interest you, use my Image Search to access over 35,000 images available NOW on this site. Or you can review a Stock List of My Subjects, Categories and Locations, but be prepared: it is a long list. Note: my online database offers "thumbnail" and "large" versions of each image and video for your review. For security reasons I must limit the number of "large" versions and videos that each visitor is permitted to view. You have viewed 2788 "large" images and/or videos which exceeds the maximum allowed. You are now able to view "thumbnail-sized" images only. If you are serious about reviewing and licensing my photographs, please contact us and I will immediately remove this restriction, enabling you to continue viewing the "large" versions of my images.